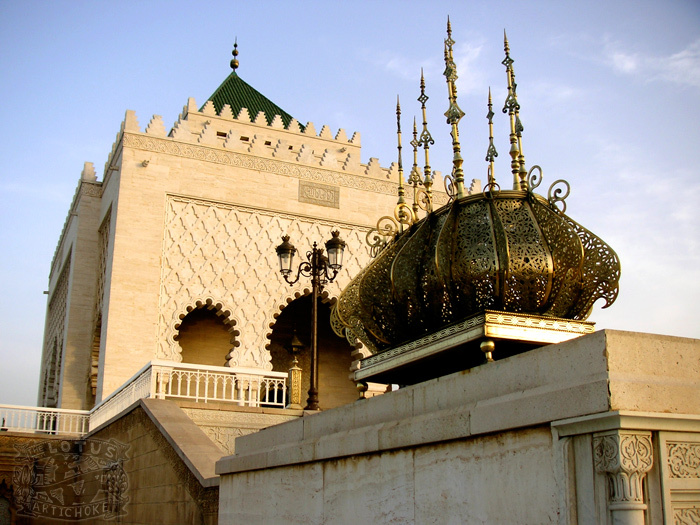 Last Thursday I found some great posts from travel blogger friends who also visited Morocco. 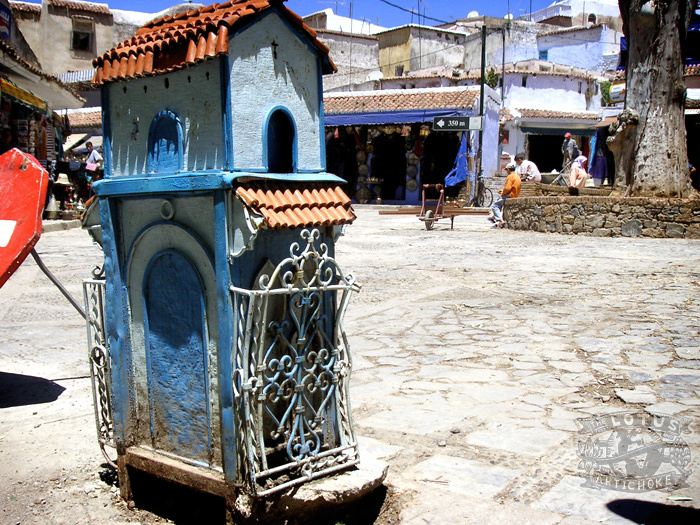 I started with Jaime’s Breakaway Backpacker post on the beautiful mountain town of Chefchouen, with breathtaking photos of the blue town. Soon, I found a similar post by Robert of Leave Your Daily Hell, and this post on Travels of Adam. 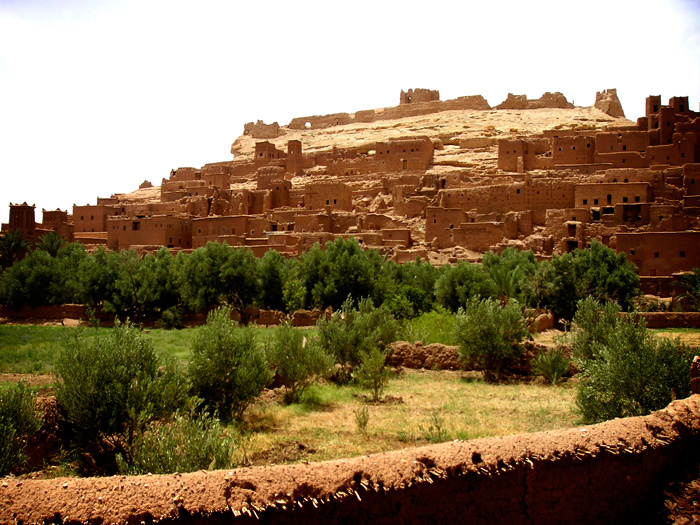 One thing you’ll probably notice: travelers have mixed experiences in Morocco. It’s an intense place. You’re sure to find great food, meet incredible people, and see some fantastic sights. However, it’s also extremely likely some of the food, people, and places will provide material for great travel stories of misadventure and malady. That’s Morocco! Isn’t it cool to read others’ blogs about places you’ve been, or dream of seeing yourself? For me, it’s a great way to relive and revive travel memories, and totally inspiring for future travel adventures. 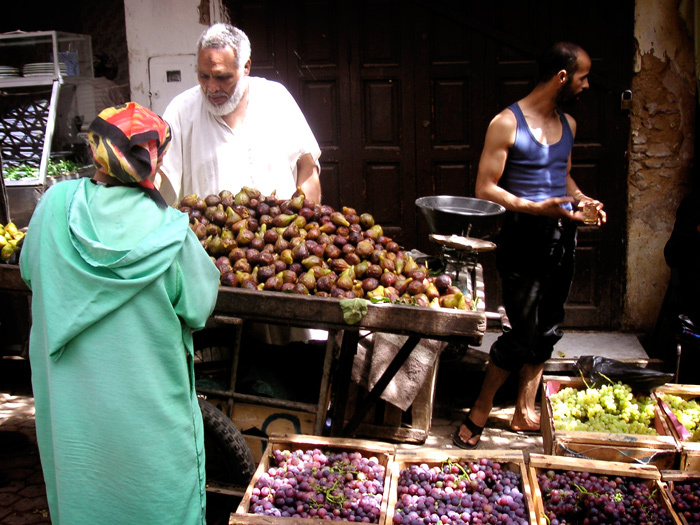 All these awesome photos and stories got me thinking about my own travels in Morocco and the food I had there. It’s true: vegetarian and vegan options in Morocco are often limited to varieties of vegetable tagine and vegetable cous-cous. After eating these two dishes twice a day you might start to get a little bored, as I did, but you never have to look too far for an excellent, unforgettable veggie cous-cous or tagine. For me, it was on one of my last nights in sleepy, chilled-out Chefchouen at a somewhat fancy restaurant decorated wonderfully with tiles, flowers, and plants. The night air was cool and refreshing, the view of the town and surrounding hills and valley: majestic. I can still smell and taste the fluffy cous-cous, the soft chickpeas bathed in a sweet and savoury stew of vegetables, and the delicate flavors of the dried fruits and nuts accenting the dish. In fact, nearly all of my kitchen adventures with Moroccan cuisine since then have been attempts to recreate the experience of that heavenly meal. 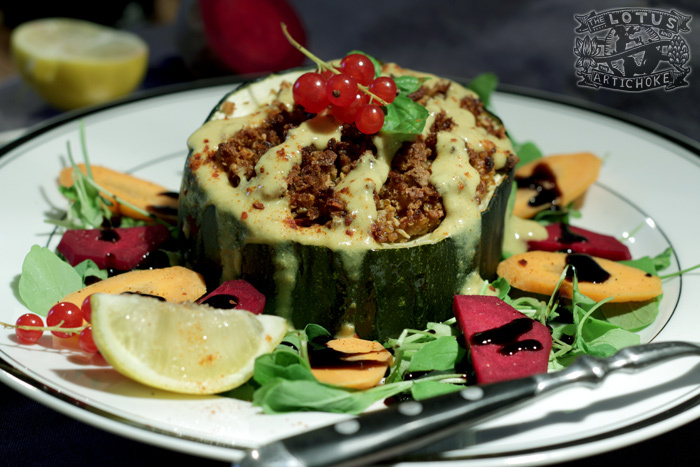 This recipe below for delicious, vegan Moroccan Stuffed Squash can be used with just about any kind of big squash, or made on it’s own as a sort of vegetable cous-cous dish or vegetable tagine. Just increase the water or stock to make more of a vegan Moroccan stew (tagine) without stuffing and roasting anything. It’s your call if you want to use the squash interior you remove in the stuff itself. With larger squash, they’re often already partly hollow or the insides aren’t always that tasty anyway. Experiment! For this meal, I used two halves of a home garden-grown monster zucchini from friends here in Berlin. It turned out super delicious. There was even vegetable cous-cous stuffing leftover for lunch the next day. Yum! I’ve also posted a few of my photos from Morocco after the recipe, including shots from Rabat, Fes, Marrakesh, Ait Benhaddou, and Chefchouen. Have you been to Morocco? What was your favorite meal? Share your experiences! Preheat oven to 400°F / 200°C / level 6. Cut squash in half lengthwise. Remove soft insides with spoon to create 4 hollow halves to be filled. Lightly oil, place squash face down on baking tray. Roast in oven for 20 min. Heat olive oil in a large pot on medium heat. Add onion, garlic, ginger, pepper, paprika, nuts. Fry until onions are lightly browned, about 2-3 min. Add chickpeas, tomatoes, carrots, apricots / raisins, cinnamon, turmeric. Mix well, fry 2-3 min. Add veg stock / water + veg broth powder, salt. Bring to boil. Cook, stirring regularly, 5 min. Stir in couscous. Return to low simmer, reduce heat to low, stir regularly, cook partially covered, until couscous is done, about 5-7 min. Turn off heat, cover. When squash halves are done pre-roasting, remove, fill with vegetable couscous stuffing. 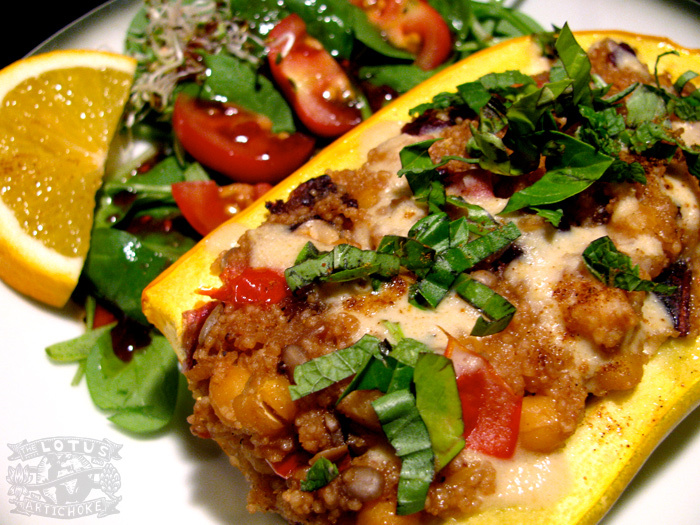 Roast stuffed squash until squash is cooked, stuffing is dark golden brown, crispy on edges, about 25-35 min. Experiment with different spices! Harissa spice may be used in addition to or in place of ground paprika. Go Italian-style with thyme, rosemary, and oregano. Substitute nutritional yeast flakes for vegetable broth powder if desired for cheesier, extra nutty flavor. Other grains including quinoa, barley, millet or even rice may be used in place of couscous. Grains requiring longer cooking times may be cooked seperately from vegetables and spices (adjust added water accordingly) and combined at the end to make stuffing prior to roasting. This entry was posted in African, Moroccan and tagged apricot, couscous, morocco, recipe, squash, tagine, vegan, vegetarian, world travel, zucchini. Bookmark the permalink. Never dealt with a squash before but this sounds amazing… Do you have to peel the squash first?? Thank you !! No need to peel the squash first, but you could if you want to. It depends if you intend to eat the whole squash, too, what kind it is, and if you like the outside (peel). I like the taste, nutrients, and appearance of the whole squash. Thanks, Stephanie. It was very tasty! 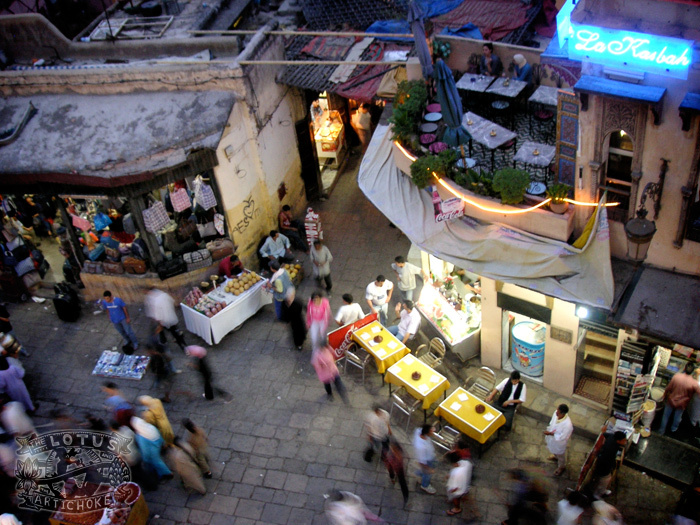 I’m going to head back over to your blog and see if you’ve been to Morocco. Ahhh this makes me miss Moroccan food so much. I wish I knew how to cook. I know when I go home I’m gonna have my mom teach me how to cook so good mexican food. Love all the photos. You’re welcome for the mention, Jaime! Thanks for the kind words about the photos. You can learn to cook! Learning some Mexican cooking from your mom sounds great. Then you can pass on some tips to me… I have a lot to learn about food “south of the border”. I’d love to spend more time there and take some cooking classes and learn from families. Hi Heidi, I’m glad your stuffed squash turned out well! Thanks for letting me know! Happy eating! I’m not a vegan or a vegetarian but unlike my wife and daughter I don’t eat red meat. My wife had bought 2 butternut squashes which we normally just cut into inch cubes and roast and use in a chicken risotto but I decided I wanted to try something different! We all love the Mediterranean and north African flavours and I had some apricots (why do people pronounce it “ape” there’s no e) although they were the juicy sliced ready to eat kind. Anyway I gave this a try, I had to swap the cous cous for quinoa (my wife had some in the store cupboard, the first time I’d ever seen it) as my wife is gluten intolerent and I didn’t have fresh ginger so I guessed at the amount of dried to use. I am also English and we don’t use cups as a measurement so I have to find a conversion web site! I got something slightly wrong on the spices as it was a bit overpowering to start with (possibly too much ginger!) I “calmed” the spices down with a touch of honey!!! I think I could have added more apricot too, are the dried ones a stronger flavour I wonder? Hi Paul, you’re certainly welcome! Sounds like your stuffed squash adventure was quite successful! I bet it was great with quinoa! Usually dried fruits work better with this type of dish, but fresh is always fun, too. Oh, Because of your comment I realized that I need to update and add the metric conversions– they’re in the cookbook for all of the recipes. I only just found your blog today. I love finding new vegan blogs to explore and yours is sure to become another favorite. Feel free to visit mine as well although in Danish I’m sure the translation works wonders. Loved coming across this recipe. Had been lucky enough to get to Maroc this past winter. Wasn’t always the easiest place to locate vegan meals in but loved what we could find. A tagine like this will be a treat to make at home and re-live some of those memories. With a good helping of mint tea! 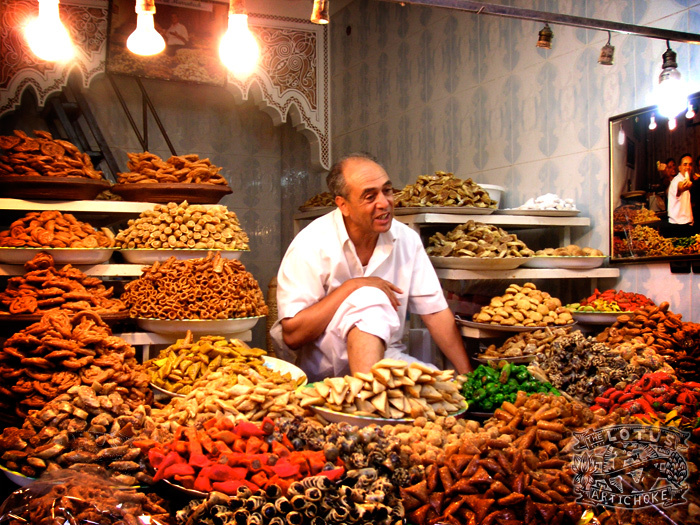 Next time I’m in Marrakesh, I’ll have to check out the Earth Café! Just made this recipe for family. Made couple of changes-added bunch of chopped spinach (was in our CSA produce basket) and used full can of chick peas. For spice used heaping tablespoon of harissa paste. Dish was perfect. Thanks for posting.